Enrico Castiglioni (January 29th, 1914 – novembre 6th, 2000) was an Italian architect, writer and engineer. He graduated in 1934 from the Politecnico di Ingegneria, Milan, after which his work became characterized by a search for unusual spatial solutions by means of structures with a reinforced concrete membrane. Among his first important projects were the buildings for the Esposizione Internazionale del Tessile (1952). The experimental nature of his approach is best expressed in buildings requiring the complex articulation of large undivided spaces, such as churches, which were a recurrent interest. Examples include a design (1953) for a church at Montecatini Terme, the project (1957) for the sanctuary of the Madonna delle Lacrime, Syracuse, and the parish church (1963), Prospiano, Gorla Minore, Varese. 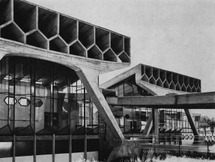 The accent on plastic qualities and the focus on the role played by light in the configuration of spaces are also recurrent features of his works and are in some respects attributable to the influence of Brutalism, as in the Istituto Tecnico Industriale and Istituto Professionale di Stato complex (1960) at Busto Arsizio, with its expressive supports. Castiglioni's tendency towards a total artistic approach to the problems of architectural space led also to experimentation with painting and sculpture, while his somewhat frustrated search for formal characterization led in some later works, such as the competition design for a church (1968) at Cattolica, Forl?, to the emergence of a figurative style that contrasts with his earlier abstraction.